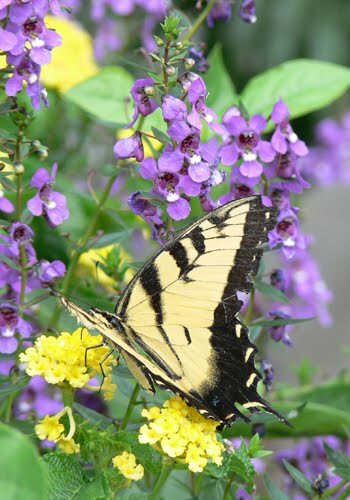 I had been a member and frequent visitor of the Atlanta Botanical Garden from1987, when I moved to Atlanta (the first time), through 2001 (when I moved to DC) and vividly remember the opening of the Fuqua Conservatory in 1989, as well as other visits. My recent visit was the first time to the Garden in more than a decade. All I can say is, "Wow!" Alright, that's not all I have to say. Since returning to Atlanta (three weeks now) following an 8.5 year life in Washington, D.C., I've driven by the Garden numerous times and it kept calling to me—it was determined to be at the top of my list of places to tour in the near term. I am so glad I went. The Garden is vastly different from what I remember. There's a new entrance, and many new gardens and vistas, including a Canopy Walk, an Edible Garden and Outdoor Kitchen, Cascades Garden and a new visitor center—all breathtaking. On this particular visit, knowing that there had been some changes, I decided to attend one of the tours—offered Tuesdays and Thursdays at 1:30 p.m. Our tour guide, Angie, a native of London, greeted us enthusiastically and it was quickly obvious that she knows what she's talking about. We'd arrived a little early and had already explored the Canopy Walk, which opened in May of this year (2010). 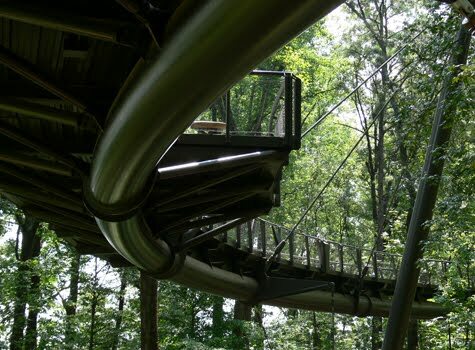 The 600 foot long Walk takes visitors 40 feet above the floor of the Storza Woods forest. The Walk itself is recognized as the only reverse-suspension forest canopy in the United States. The views from the Walk and from the forest floor are quite 'lifting,' in spirit and sight. Angie started with a brief history of the relatively recent additions and upgrade projects in the Garden, including a background discussion of the bright green, pitcher plant-inspired parterre hanging in the two-story Hardon Visitor Center. The parterre once hung in the carnivorous plant rotunda of the Fuqua Conservatory, but was moved to the Visitor Center when it opened in 2008 so more visitors could enjoy its beauty. 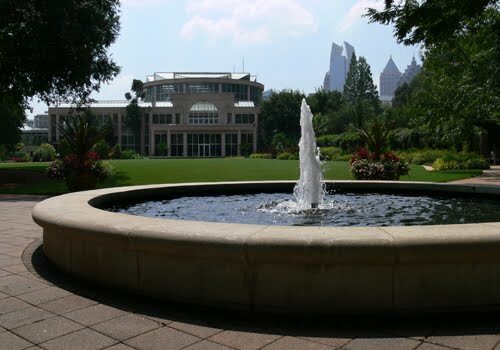 The first stop on this particular tour, tailored for the tourists in our group (five of us, all Atlantans), was the Levy Parterre, centered between the Alston Overlook, Day Hall, the Rose Garden and Mershon Hall. The garden hosting the Levy Parterre is one of the two best spaces in the Garden to catch a glimpse of Atlanta’s Midtown skyline. Parallel to the Levy Parterre garden is a walkway, leading to the Great Lawn, which is lined with towering Crape Myrtles…I'd never seen this species reach such heights! Next, we visited the tranquil Japanese Garden, which we entered by passing through a Chinese Moon Gate. Remember to make a wish when you pass through the Moon Gate! Angie told us that one of the stone Japanese lanterns (near another entrance to this particular garden) was a gift from Atlanta's sister city in Japan and is more than 300 years old. The Edible Garden has a design that I found particularly fascinating and amusing. Crop Circles! Although there was nothing "alien" in this section of the Garden (or any other section for that matter), it was amazingly well-designed and mature compared to many other fruit and vegetable gardens I've seen in other public botanical spaces. The Outdoor Kitchen, occupying one of the circles, is a fully-functional kitchen and is used for cooking demonstrations, mostly on the weekends and during special events. It even has an outdoor fireplace with a sitting area, presumably used in the fall and early spring. 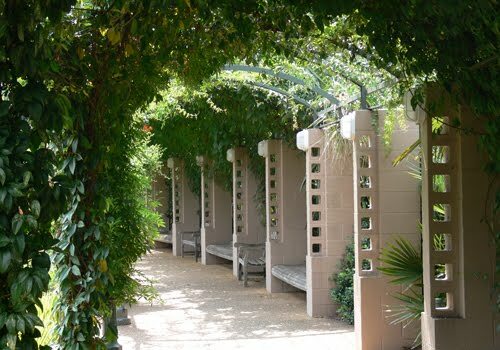 Next, and one of the most popular destinations within the Garden, was the Fuqua Conservatory, home to more than 2,000 species of orchids, desert plants and approximately 800 species of palm trees. I'm not sure how they got 800 species of palms in a relatively small space, but it's as dense as a tropical rainforest, so I shouldn't be surprised. One of the Garden's conservation projects includes the preservation of frogs. Currently, frog life around the world is threatened, and in some cases endangered, and the Atlanta Botanical Garden, home to frogs for more than two decades (that I know of, maybe longer), is actively supporting the effort to return frogs to their native habitats. The bright yellow, blue frogs and the leaf frogs are particularly fascinating. Our tour wrapped up with a visit to the Aquatic Plant Pond, a discussion on the creation of the Atlanta Botanical Garden relative to Piedmont Park and a walk around the Great Lawn through the Vine Arbor, where live music is regularly enjoyed by Garden visitors and tourists. 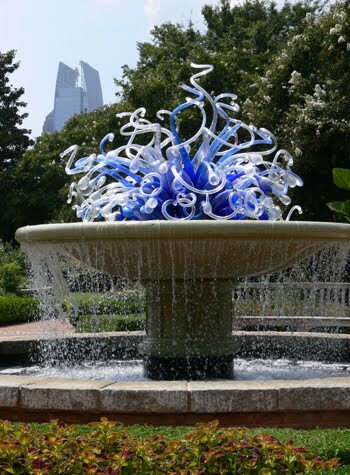 Is the Atlanta Botanical Garden on my visit-again list? I'll let the fact that I purchased a new membership speak for itself. There’s a lot more to see and do than what I’ve mentioned here, including classes, a Children's Garden, the Garden Cafe and special events. So be sure to ask for a garden map at the visitor center and plan ample time to see all the points of interest that pique your curiosity. April - October, 9 a.m. - 7 p.m.
November - March, 9 a.m. - 5 p.m.
Thursdays, May - October, 9 a.m. - 10 p.m.
Closed Mondays except for Monday holidays such as Labor Day and Memorial Day. Closed Thanksgiving, Christmas and New Year's Day. Can't wait to visit and get a full tour!